Business drone use is a trend that isn’t likely to fade away. Current commercial uses for unmanned aerial vehicles include the monitoring of agricultural crops, photographing real estate and managing wildlife. Among those in the works are Amazon’s plans to use drones for deliveries. There has also been discussion of using solar-powered drones capable of remaining aloft indefinitely to beam WiFi signals to the ground to provide sparsely populated areas with Internet access. Germanna's Daniel Technology Center in Culpeper. According to Fortune magazine, by July of 2015, there were over 500 businesses in the U.S. cleared by the FAA to operate drones for commercial purposes. An industry study recently predicted that by the year 2025, the commercial use of drones could add $82 billion and 100,000 jobs to the U.S. economy. Locally, Germanna Community College will begin using drone flyovers to help Cedar Mountain Stone monitor progress at its Mitchells Quarry. The first flyover, on a date yet to be determined in late October, will take place during a blast at the quarry. 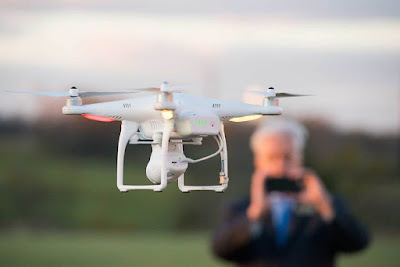 According to Ben Sherman, a Germanna Center for Workforce Business & Career Coordinator based at the GCC Daniel Technology Center in Culpeper, the drones will be doing aerial photography for photogrammetry and using two-dimensional photos to make a 3D point cloud to model progress at the quarry. The goal will be to determine the amount of stone removed. This will allow Cedar Mountain Corporation to more closely monitor the amount of material being extracted from and ultimately sold by the quarry. This will be part of a new Germanna Community College Center for Workforce program at the Daniel Technology Center in Culpeper focusing on drone training for commercial applications. Students will learn how to maintain drones and how the actual programming works—how to download information and process it, as well as the necessary flying skills, Sherman said. The FAA is expected to require increasing levels of training and certification for those who fly drones for commercial use to earn certification, due to safety concerns. Germanna had already been providing classes primarily for drone hobbyists, including basic flight training and even teaching middle school children to build their own drones using a 3D printer. “Now we’re going into business and construction applications,” Sherman said. He said Germanna’s Center for Workforce is prepared to help local businesses navigate evolving federal and state drone regulations. Will this class be available for distance learning?